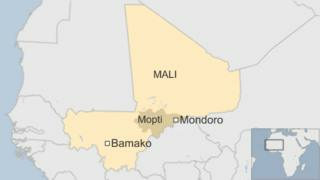 Three Malian soldiers were killed when their vehicle hit a landmine in the central region of Mopti, officials say. Two others were wounded and taken to a hospital, the defence ministry said in a statement. No group has claimed responsibility for the device. Mali has been threatened by various armed groups and has fought Islamist rebels in the north for a number of years. The incident happened in Mondoro, next to the border with Burkina Faso, the statement said. Al-Qaeda-linked militants have been fighting the army in northern Mali and France, the former colonial power in the country, intervened in January 2013 to stop their advance south to the capital. But attacks across the country have increased recently, including a shooting at a hotel in the capital, Bamako, that left 22 people dead in November.